If you’re planning a baby shower and looking for fun baby shower games, check out these 15 Entertaining Baby Shower Games everyone will love! If you’ve ever attended a baby shower you know they are more exciting with some fun baby shower games. There are so many fun and easy baby shower game ideas you can play at your shower that will show your guests a fun time. There are some games that everyone knows and are played at every baby shower, so if you are looking for unique baby shower games, you’re in for a real treat! Everyone wants to be a winner, so it’s always great to see everyone’s competitive side come out! 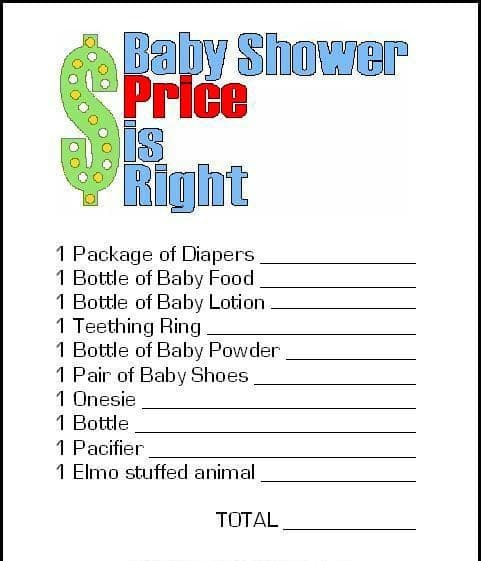 And if you’re sticking to a strict budget for your baby shower, there are tons of free printable baby shower games that you can print out. It doesn’t get much better than free baby shower games! The days of sitting around drinking tea to celebrate baby are long gone ladies! Today’s moms and dads are having gender reveals, baby naming parties, and even co-ed baby showers! So you definitely need to up the fun with a variety of baby shower games and activities. If you want your guests laughing and having a good time, incorporate a few of these 15 Entertaining Baby Shower Games! Drink Up Baby: Fill baby bottles with your drink of choice. Guests have to chug the baby bottles and whoever is done first wins a prize! Place the Baby on Mommy: Enlarge a photo of mommy and print out pictures of babies. Think pin the baby on mommy! Baby Shower Game Idea #1: Aren’t you glad you’re not an elephant? Yes, I had to google answers but they sure surprise you! This Animal Pregnancy Game will definitely stump your guests! Even though this printable baby shower game may be a challenge, that’s what makes it fun! 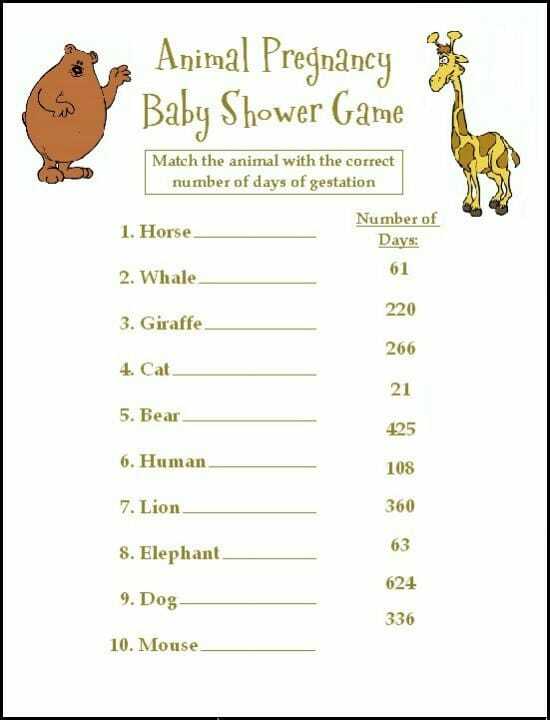 Whoever gets the most answers correct wins a prize – maybe the biggest and best prize you have since this is one of the harder baby shower games! Baby Shower Game Idea #2: Bowling is always fun with your closest friends! 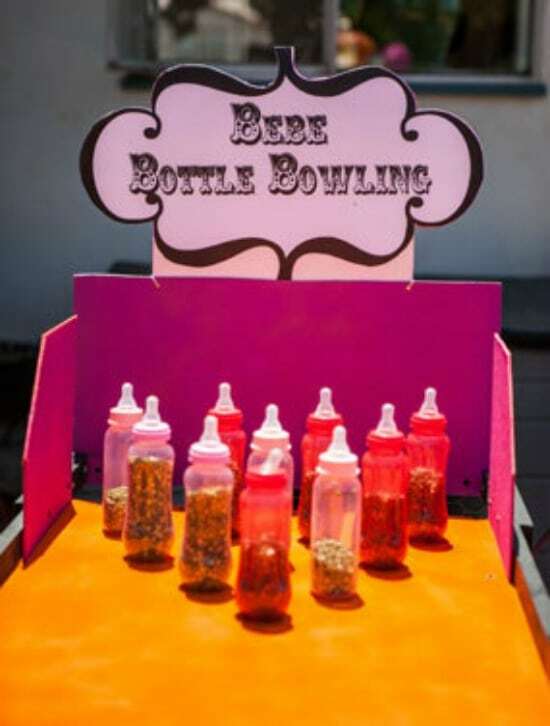 Baby Bottle Bowling is a game of bowling but with baby bottles! Set the bottles up the way bowling pins are arranged. Create space for a lane leading up to the bottles. Have guests take turns bowling (two turns per guest) to see how many pins they can knock down. The guest who knocks down the most pins wins a small prize! This is a great game to put on your list of baby shower games! Baby Shower Game Idea #3: If the mom-to-be likes Jeopardy, this Baby Jeopardy Game is the perfect baby shower game! This game works just like the television show, but you have to get a little crafty. 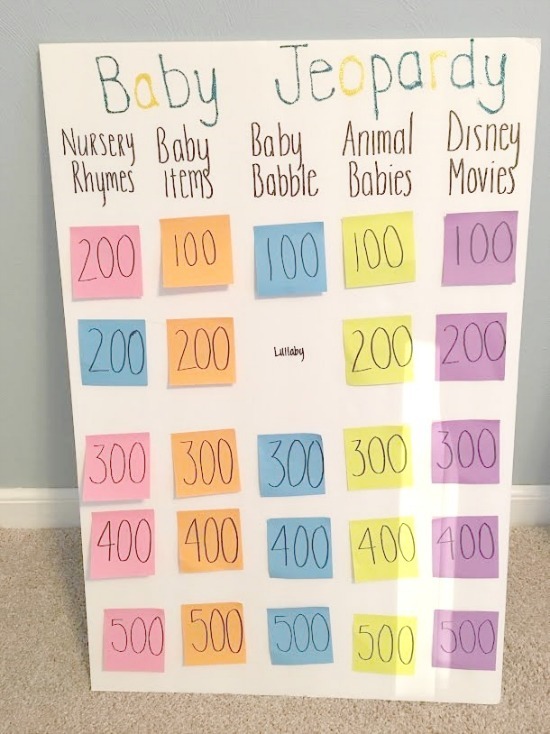 Make a board with various categories related to babies and the point amounts for each category. Guests will have a blast playing this trivia game for fun prizes! 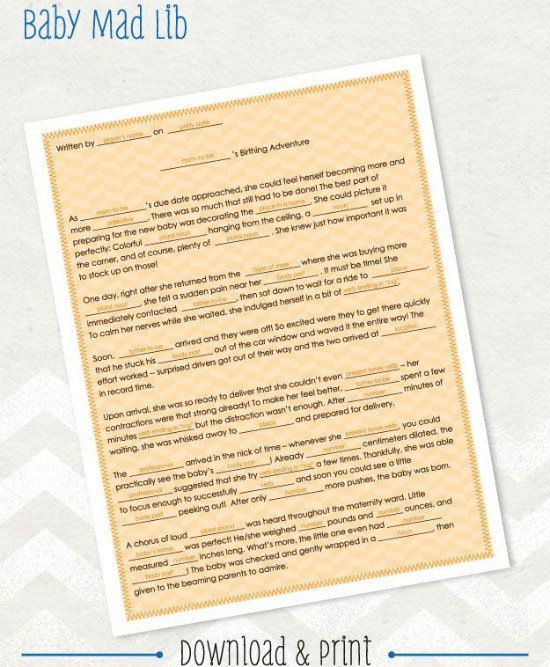 Baby Shower Game Idea #4: Remember Mad Libs when you were younger? They are STILL tons of fun! So why not play Baby Mad Libs at your baby shower?! 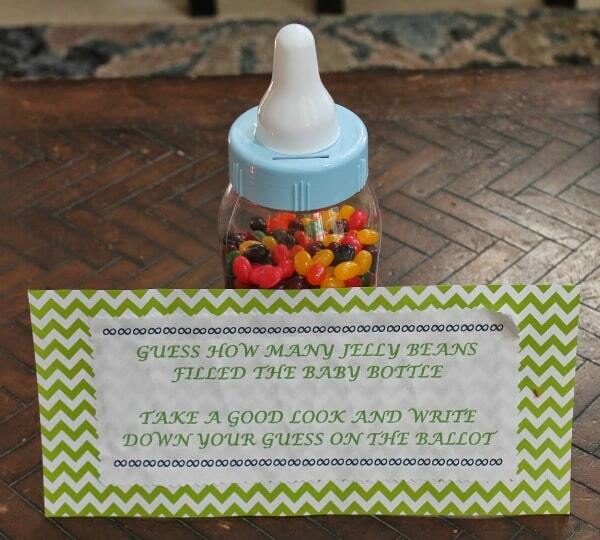 This free printable baby shower game will have everyone belly laughing! 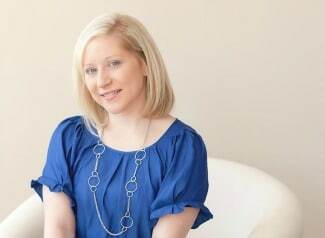 The story is all about the mom-to-be aka guest of honor. Guests can create her birthing adventure with this hysterical game. Baby shower games that will have everyone laughing is what it’s all about! Baby Shower Game Idea #5: Looking for a silly baby shower game? This Baby’s First Portrait Game is so funny! Watch as players try to blindly draw a portrait of what they think the baby will look like by placing a notecard on their foreheads! Then the mom-to-be picks the best and worst drawings as the winners. Baby Shower Game Idea #6: Another fun baby shower game is the Candy Bar Game! Grab this free printable baby shower game and have some fun! This game is perfect for a co-ed baby shower as well! Baby Shower Game Idea #7: How “star-studded” are your guests? Find out with the Celebrity Baby Name Game. This is also a free printable where guests match up celebrities with their babies. Which one of your pop culture-loving friends will be the winner? Baby Shower Game Idea #8: How well do guests really know the expecting couple? Find out with this free printable Daddy or Mommy Game. Guests read each sentence and have to circle if it’s Mommy or Daddy. There is also a Free He Said She Said Game Printable to play after the Mommy or Daddy Game. 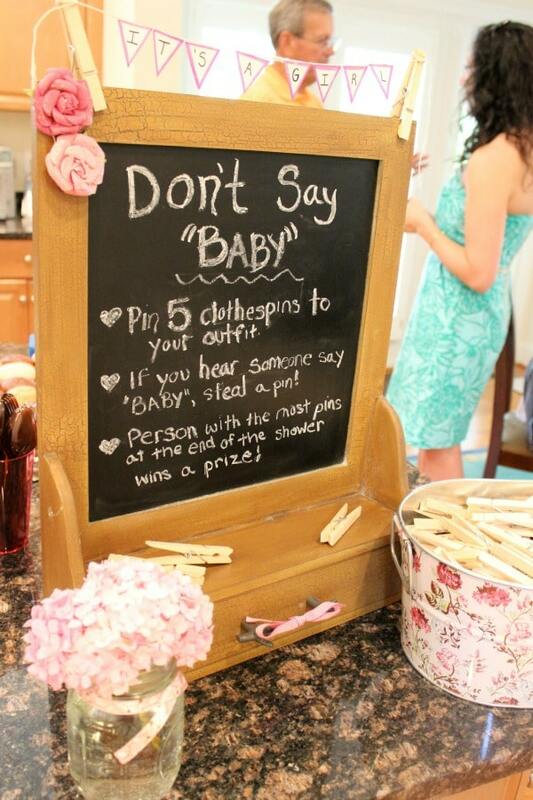 Baby Shower Game Idea #9: This is a fun baby game where the object is to steal clothespins from other guests when you hear them say “baby.” The one with the most clothespins at the end of the game wins a prize! Don’t say “BABY” is a fun baby shower game that will have guests saying “Oh I forgot!” Do you know how hard it is to not say “Baby” at a baby shower?! Baby Shower Game Idea #10: Sometimes it’s fun watching your friends pick up a baby bottle, shake it, and try to count millions of candy, or in this case, jelly beans! The Guess How Many Candies/Jelly Beans in the Baby Bottle Game will have everyone guessing. Players who guess closest to the total number of jelly beans wins a cool prize! This one is definitely on our list of easy baby shower games. Baby Shower Game Idea 11: Looking for interesting and unique baby shower games? Have you seen the weird combinations of baby foods lately?! Come up with the most interesting baby food combinations you can find and guests have to guess them with a fun taste test in the Guess the Baby Food Game. 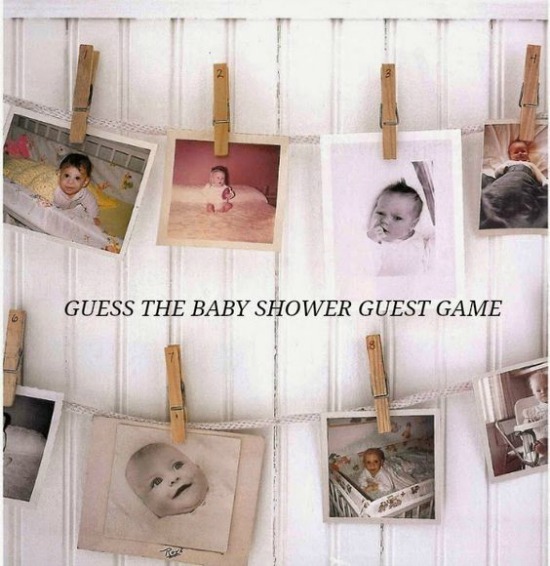 Baby Shower Game Idea #12: Guess the Baby Shower Guest is one of our top baby shower games! Ask guests to send their own baby pictures before the shower date and then have a game of guessing who is who! This one could definitely be difficult, but so much fun! Baby Shower Game Idea 13: Looking for classic baby shower games? 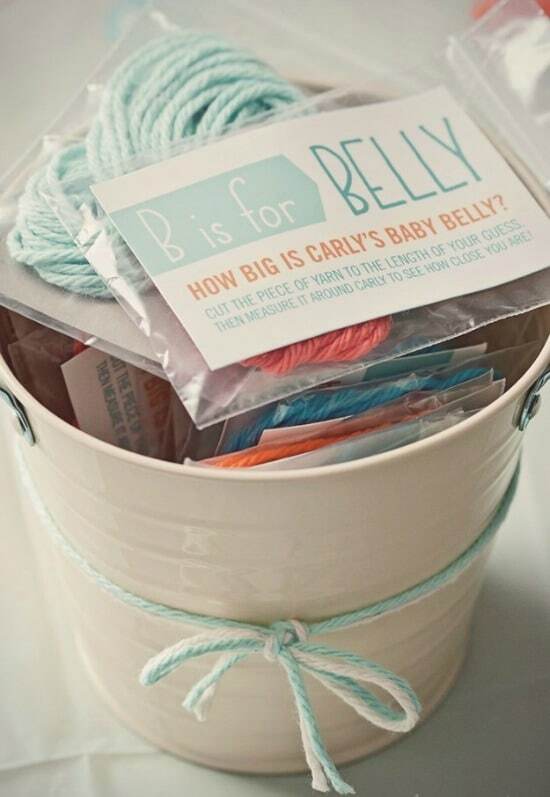 For this one, have guests cut pieces of yarn to a length they think corresponds to the circumference of mom-to-be’s belly. Might as well have fun with the one time it’s OK to comment on a woman’s growing waistline! See how close everyone gets when playing the Measure Mom’s Belly Game! 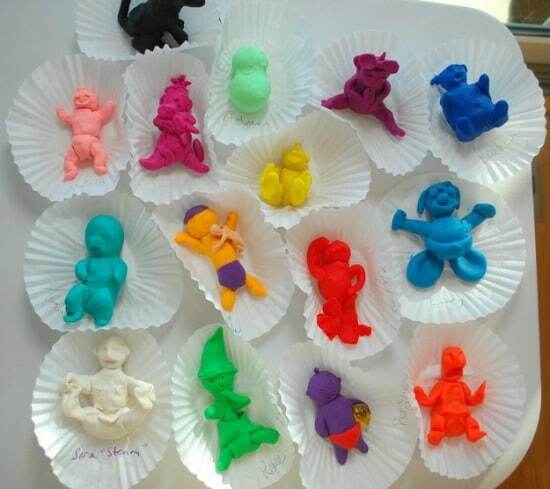 Baby Shower Game Idea #14: Try out your sculpting skills with this unique baby game! The idea behind this Make A Baby Out Of Play-Doh Game is to sculpt the most realistic baby out of Play-Doh. The mom-to-be then votes who did the best job. 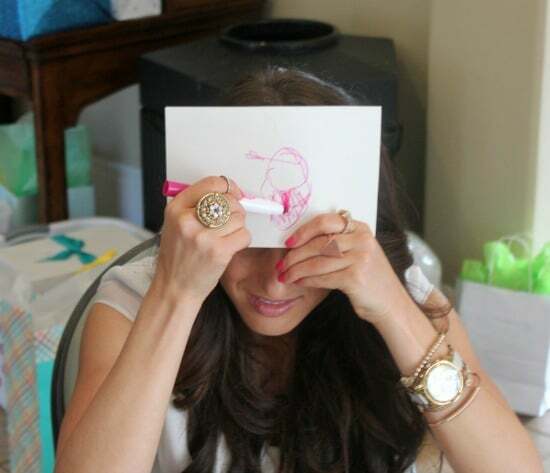 We love baby shower games where guests can really get in on the fun with their creativity. Baby Shower Game Idea #15: One of the top baby shower games is the Price Is Right Baby Shower Game! Grab this free printable to add to your shower game list. Your friends and family will have a total blast playing this classic game! Bonus Baby Shower Game Idea #16: Are you looking for baby shower games everyone will love?! 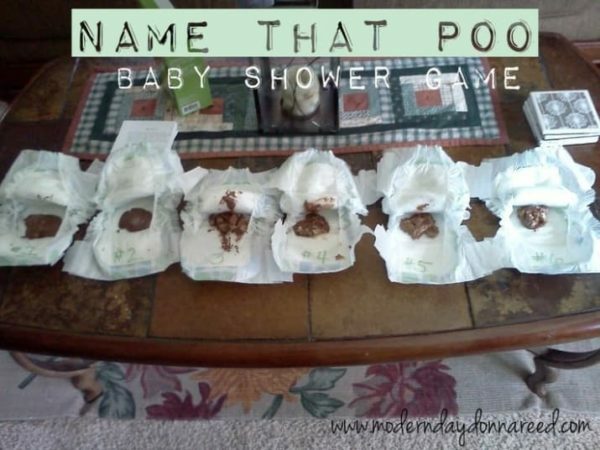 Don’t forget to add Name That Poo Game! The idea behind this funny game is to melt different chocolate candy bars and place a spoonful into baby diapers. Guests will have to guess what type of candy bar it is by smelling or tasting it. No matter which one of these 15 Entertaining Baby Shower Games you choose, your guests will have a blast! 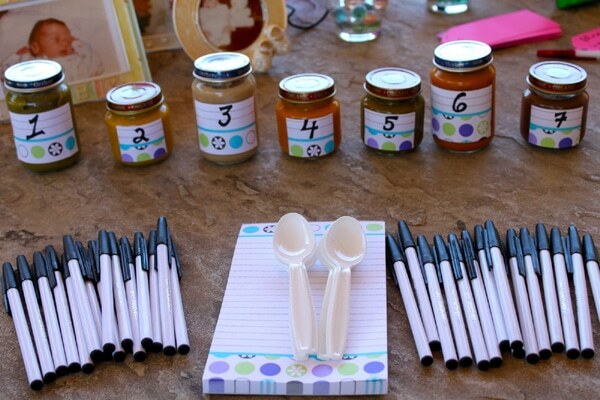 Be sure to check out this list of the Top 20 Best Baby Shower Game Ideas by Beau Coup. What other baby shower games have you played at baby showers? Share them with us in the comments below! For more baby shower and party ideas, follow us on Instagram @prettymyparty and Pinterest and join us in our private Facebook group.